In 2017, the HHS Office of the Inspector General (OIG) remained active in detecting Medicare and Medicaid provider violations, resulting in fines or settlements and exclusions from participation. There were over 3,100 exclusions in 2017, with Florida, California, New York and Texas continuing to have the greatest number of excluded individuals. By far, nurses and nurse’s aids are the positions most often excluded. 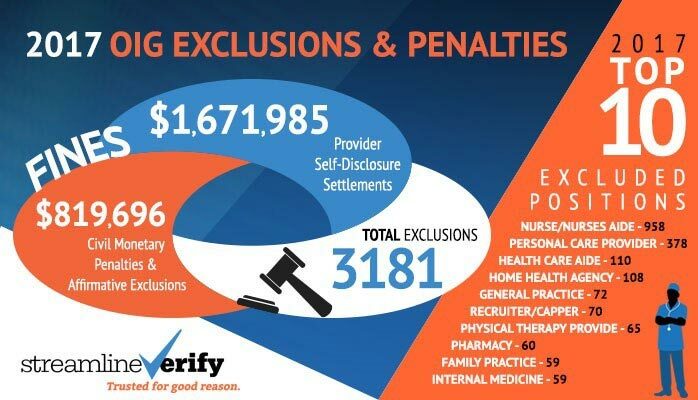 OIG collected nearly 2.5 million dollars in fines and settlements, with nearly 1.7 million coming from provider self-disclosure settlements and nearly $820,000 in civil monetary penalties this year.